Sunday's sketch outing was fun...having the cruise ship docked was a great prop and gave the waterfront a more festive feeling! 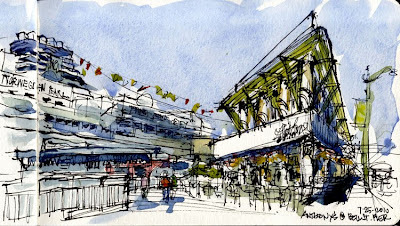 It was great seeing the work of all of the local Seattle Sketchers. And what a treat to get to see both Tia's and Gerard's work in person. It was inspirational! Gabi really wanted to get some of us up to the upper deck area to sketch. Unfortunately that observation deck is closed when a cruise ship is in, so we sketched the waterfront and the skyline from the Bell St. Bridge. Here is my attempt using a Lamy pen. I also ended up doing a sketch at Anthony's Home Port Restaurant using my new Sailor Calligraphy pen 55 degree nib. I can almost always recognize your sketches Gail. Your lines have such vitality and, of course, perspective. Really nice.